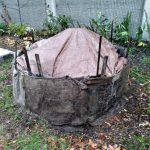 Last week, three of us poured our energy into designing a proper thermal compost pile. Today was the critical third day after the initial turning of the pile. Did the center stay above 131 degrees F? Drum roll. Both thermometers read 155. We did it! 131 F for three days. These temperature requirements are necessary to kill human and plant pathogens, insect pests, and weed seeds. If your pile does not heat up or, it does not heat after turning, the problem is often due to lack of nitrogen in the recipe and/or the pile cooling down too much from turning. 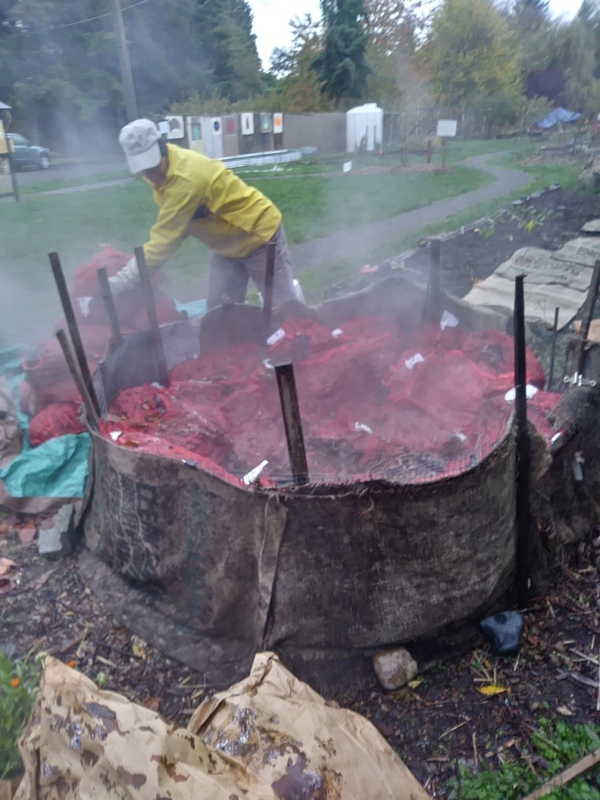 During our first try last May, the pile did not heat up enough after we laboriously turned the insides to the outsides and the outside materials to the inside with garden forks. What an effort. No wonder no one turns a compost pile. We came up with a new trick this time and it worked. Welcome to the stage … mesh onion bags! Kate and Ruth carefully mixed all of the ingredients and then stuffed them in the red bags. 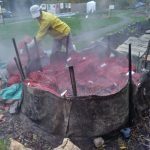 The bags that would be in the hot center of the pile were laid inside the chicken wire frame standing straight up. In contrast, the other half of the bags, those that filled the cooler perimeter, were laid in horizontally. 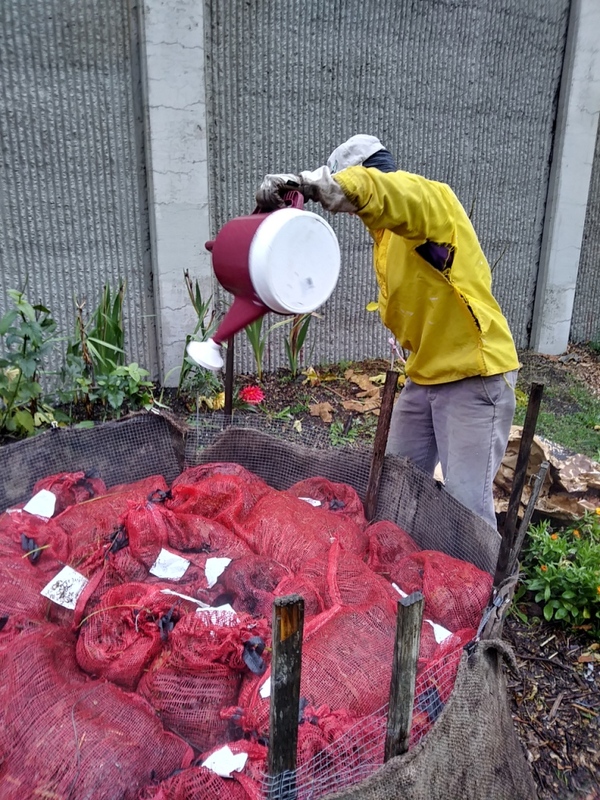 From the bag orientation, we could tell which compost had been in the hot center and which had not. The center bags heated up in no time and remained at 150 F for two days. Time to turn the pile. All the bags surrounding those hot bags went to the middle of the pile and the hot bags came out to surround those new center bags. The turn took two volunteers 10 minutes and was not the least bit backbreaking. 3) anyone could help turn the compost pile without needing to be strong as an ox. The whole process took seven days. Now the pile will cool to ambient temperature and evolve over the next several months. 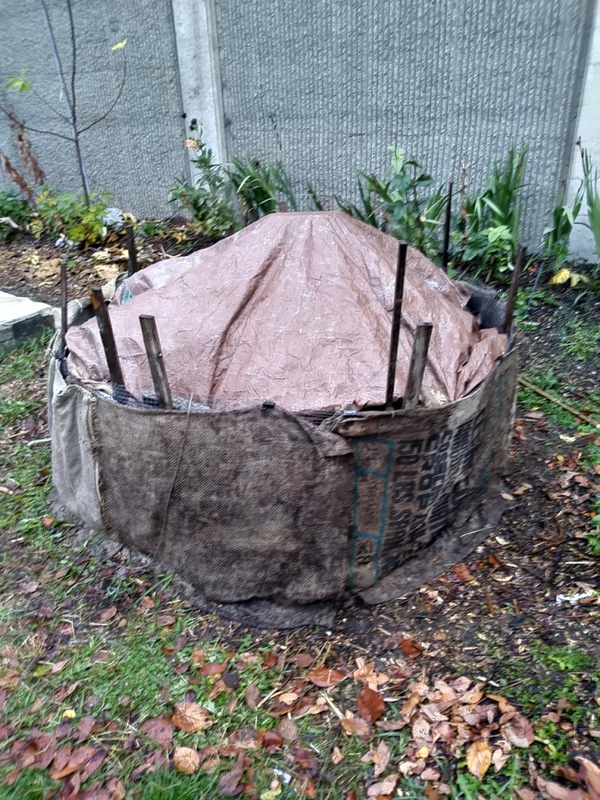 We will make good use of the finished compost next spring. How can we improve upon our new idea? We would like to work with bags made from natural material instead of polypropylene. Let us know if you have an idea. 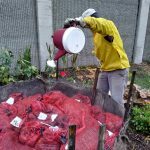 This entry was posted in Plants and tagged compost on November 6, 2017 by Ruth.